The Carpet Pro CPU1T Heavy-Duty Upright Vacuum Cleaner has been discontinued. The Carpet Pro heavy-duty upright vacuum cleaners are designed for commercial-grade cleaning performance. The Carpet Pro CPU1 and CPU1T vacuums feature a metal handle, a metal bottom plate and a metal brush roll for long-lasting use. Includes a 1-year warranty. See our expert ratings & reviews. The Carpet Pro CPU1 and CPU1T vacuum cleaners are great for both home and commercial settings. Built with heavy-duty, durable construction, these vacuums feature a metal handle, a metal brushroll and a metal base plate, ensuring years of impressive cleaning performance. Both models can lay flat to the floor, making it easy to reach under furniture in your space. The Carpet Pro CPU1 and CPU1T feature a built-in headlight that illuminates the cleaning path during use, so you won't miss any dirt or particles while vacuuming. Both models feature a 12-inch cleaning path, a 30-foot power cord, a soft furniture guard and 4-stage electrostatic filtration that helps to remove pollutants and allergens from your space while you're vacuuming. The CPU1T comes equipped with on-board tools for above-the-floor cleaning: a telescopic wand, dusting brush, crevice tool and a 6-foot extension hose. Both models include a 1-year manufacturer's warranty. The CPU1 and CPU1T upright vacuums are tough enough to handle commercial cleaning tasks, but were designed for everyday household cleaning. 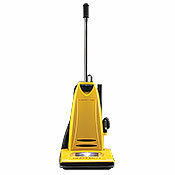 Both models feature durable all-metal construction, providing years of powerful cleaning. The CPU1 and CPU1T are also great at picking up pet hair, so they are a nice option for pet owners. The CPU1 and CPU1T heavy-duty upright vacuum cleaners are a great choice if you're looking for a durable and powerful vacuum for your home. These models were both built to last, featuring an all-metal construction that can stand up to big messes. The CPU1 and CPU1T were designed for everyday use and make it easy to vacuum around and under furniture with their flat-to-the-floor feature and soft furniture guard. The built-in headlight makes dirt and other particles on the floor easily visible, ensuring you'll pick up everything the first time around. The CPU1T includes on-board tools and an extension wand that make it easy to clean surfaces above the floor, like stairs, furniture and curtains. Both models include a 1-year manufacturer's warranty. Weight of vacuum 19 lbs.